We’re so happy to announce our next Dentistry from the Heart event for 2015! 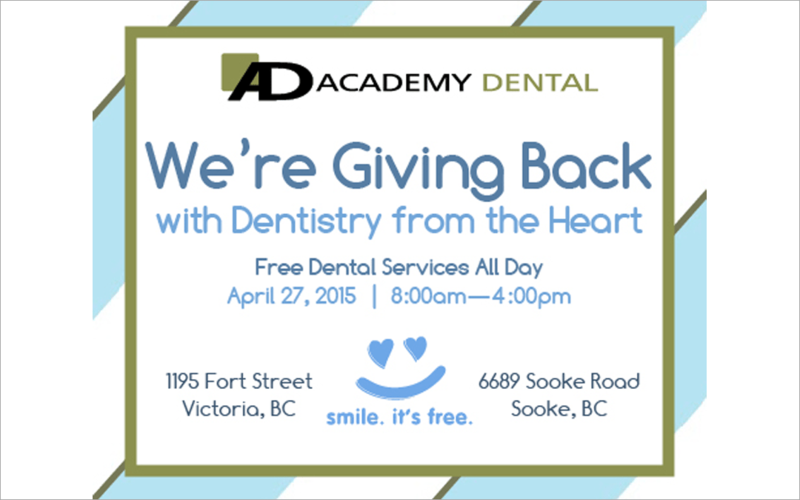 On Monday, April 27, between 8:00am-4:00pm, our Fort and Sooke locations will be providing free dental care to our children and adult patients. Our past Dentistry from the Heart events have been huge successes, which is why we’re so happy to carry on the tradition this year. Did you know that many Canadians are unable to afford even basic dental care? With the help of this event, that no longer has to be an issue. Our Victoria dental practice is aiming to help those who need dental care the most with our essential services. Please note that this event is on a first-come-first-serve basis, with adults and children welcome. We’ll be providing services such as oral exams, dental cleanings, fillings, and extractions during 8:00am-4:00pm on the day of. Dentistry from the Heart has been a huge success for our Victoria dental office. In 2013, we donated $35,000 in services and in 2014, we donated $42,000! We know this year will be another triumph, for us and for those we’re able to provide services to. Dentistry from the Heart was started in 2001 by Florida dentist, Dr. Vincent J. Monticciolo. It has grown into a world-class event with more than 300 events per year in the United States, Canada, Ireland, Australia, Puerto Rico, Hawaii, and New Zealand. At Academy Dental, we’re so proud to be able to be a part of it! If you’re interested in receiving free dental services at Academy Dental, be sure to come see us on Monday, April 27 between 8:00am-4:00pm for free dental care. We’re so excited to see you! Please contact us today for more information.